The 2014 Malibu – is a roomier, more refined and more efficient execution of its midsize sedan. Updated styling, a revised interior, a new 2.5L standard engine and suspension enhancements highlight the changes. It goes on sale this fall. Malibu’s revised front-end appearance is influenced by the all-new Impala, creating a more cohesive look across Chevrolet’s sedan lineup. The front fascia features a new, more prominent lower grille and the hood extends down and over the leading edge of a narrower upper grille. The grille openings – with black grille texture – are wider and accented with chrome. Inside, redesigned seats contribute to greater rear-seat space and greater comfort. The front seatbacks are shaped to improve rear-seat knee room, while new cushion sculpturing and revised cushion material allow passengers to sit deeper in the rear seats. Approximately half an inch was trimmed from the front of the rear seat cushion, for greater comfort behind passengers’ legs. 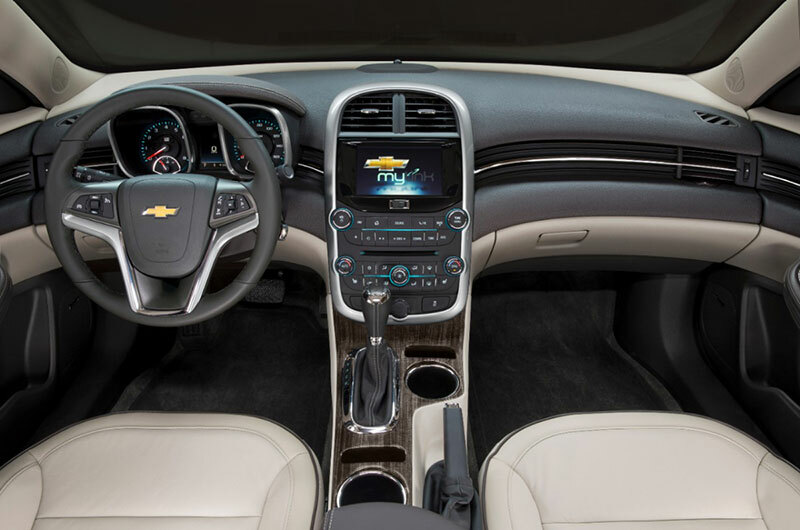 The Malibu’s redesigned center console has a longer armrest designed for greater comfort, along with a pair of cup holders and dedicated storage for two cell phones. An all-new Ecotec 2.5L Intake Valve Lift Control DOHC four-cylinder engine with direct injection is the 2014 Malibu’s standard engine. Its variable intake valve actuation enhances efficiency and helps lower emissions, while also enhancing low-rpm torque, for a greater feeling of power at lower speeds. When the iVLC system operates in low-lift mode, the engine pumps only the air it needs to meet the driver’s demand. The system switches to high-lift mode at higher speeds or under heavy loads, providing the full output capability of the engine. New start/stop technology shuts down the 2.5L engine to save fuel when the Malibu stops momentarily, such as at stoplights, contributing to an estimated 5-percent increase in city fuel economy. The engine automatically starts again when the driver takes his or her foot off the brake. An auxiliary battery powers electric accessories such as the climate system, power windows and radio during engine restarts. The new 2.5L is SAE-certified at 196 horsepower (145 kW) and 186 lb-ft of torque (253 Nm). Revised transmission shift points and quicker shifts also enhance the feeling of performance – while delivering greater refinement. Additionally, the 2014 Malibu’s available 2.0L turbo engine delivers nearly 14 percent more torque than its predecessor. It is SAE-certified at 295 lb-ft (400 Nm). New engine calibration and tuning account for the improvement, making the Malibu 2.0L turbo’s torque the best in the segment, even among competing six-cylinder-engines. The result is a stronger feeling of acceleration from a stop and a greater feeling of power on demand in almost all driving conditions. The 2.0L turbo also produces an SAE-certified 259 horsepower (193 kW). The Malibu ECO remains in the lineup and receives the exterior and interior upgrades as well as chassis and suspension updates. 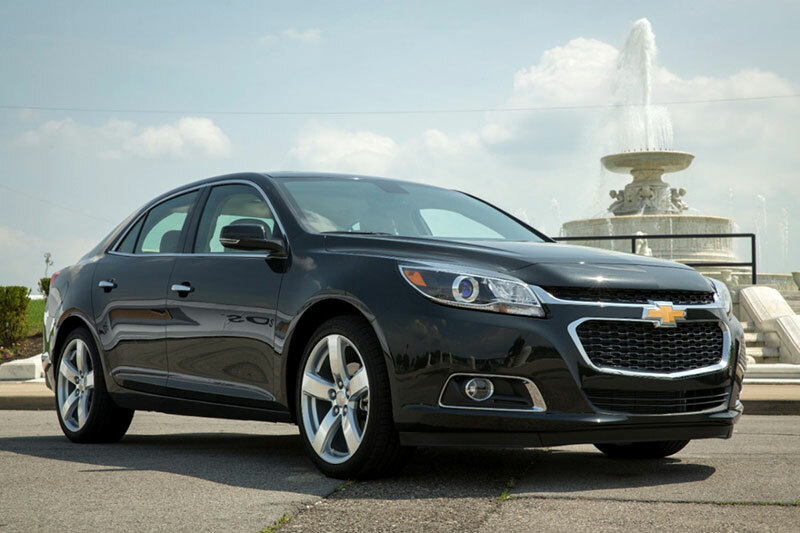 Chassis and suspension updates inspired by the all-new 2014 Impala also contribute to the 2014 Malibu’s more refined driving experience, including rebound springs that are internal to the struts. They enable more refined calibration of the dampers for a smoother overall ride, while also improving body roll control and weight transfer during acceleration or turning. That helps keep the wheels planted, contributing to a more precise, controlled feel – especially while cornering. Fuel-saving electric power rack-and-pinion variable-effort power steering is standard and enables nearly effortless low-speed maneuvers and a higher degree of steering feel at higher speeds. Revised, higher-effort calibrations for 2014 were engineered to improve the overall steering feel. Also, the Malibu’s brake system has been revised to provide a more confident feel. Additional chassis control technologies include four-channel anti-lock brakes, full-function traction control, four-corner electronic stability control, electronic brake force distribution, brake assist system, corner brake control, hydraulic brake fade assist and drag torque control. New Side Blind Zone Alert and Rear Cross Traffic Alert safety features are offered, and the Malibu also comes with 10 standard air bags and an available rearview camera system.